The Finnish Centre of Expertise in Comprehensive Crisis Management was founded jointly by the Finnish Defence Forces International Centre (FINCENT) and the Crisis Management Centre Finland (CMC Finland) in November 2008. The core tasks of the Centre of Expertise are to develop understanding on the comprehensiveness of, and coordination, in crisis management, both on national crisis management capacity building and preparedness, as well as crisis management and peacebuilding missions, and to create a clear framework for the already existing co-operation between these two institutions. The Finnish Centre of Expertise is based on the so called shared campus –principle with the responsibility shared between FINCENT and CMC Finland, both of whom continue functioning as independent governmental institutions. The Finnish Centre of Expertise in Comprehensive Crisis Management aims at developing common and joint training in crisis management as well as promoting overall understanding of comprehensive crisis management. In addition to training, the tasks include research, publishing and seminar activities. The Centre of Expertise organised a pilot training course titled “Integrated Crisis Management” (ICM) in autumn 2008. In spring 2009, in order to promote human security in crisis management missions, a training course “Applying Human Security to Crisis Management and Peace-Building” was organized under the aegis of the Centre of Expertise. The Centre’s annual training calendar will include Integrated Crisis Management trainings and introductory trainings on both European Union Crisis Management and United Nations Peacekeeping and Peacebuilding. The Centre’s activities are supervised by the inter-ministry Civil-Military Coordination Group led by the Finnish Ministry of Interior whereas the day to day planning and conduct of activities are led by the Centre’s Steering Board. Finnish Defence Forces International Centre (FINCENT) since 2001; formerly the UN Training Centre, founded in 1969. NATO/PfP Training Centre (PTC) since 2001. 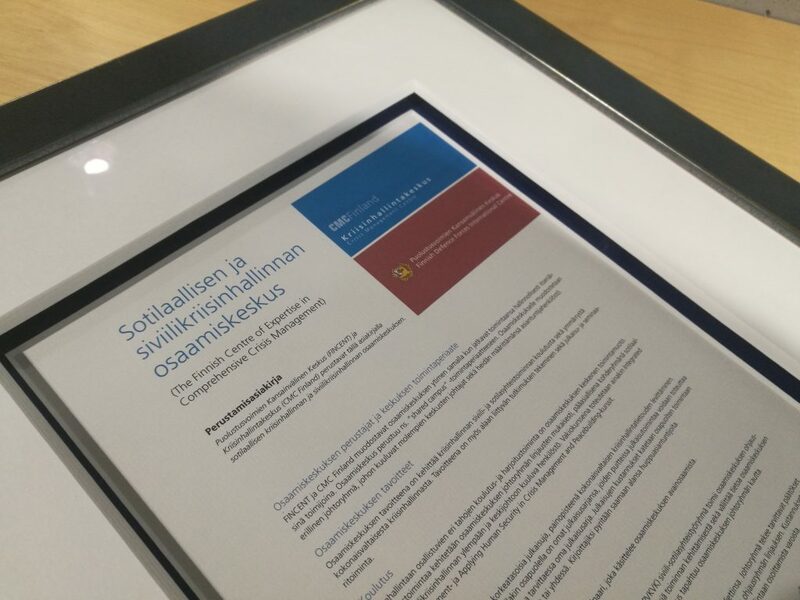 FINCENT handed over the national responsibility for crisis management operations to the Pori Brigade in January 2008. FINCENT functions were transfered to Santahamina, Helsinki. The new task enables FINCENT to concentrate purely on courses, seminars and exercises within the framework of the UN, NATO, NATO/PfP and the EU. Demanding and challenging training can be carried out successfully using modern training equipment and the excellent terrain for exercises conducted by professional and experienced instructors.